Holding a dog walk fundraiser is a great way to earn money for your group, have fun, and give people a valuable service at the same time. From the planning to the actual walking, there are plenty of ways to get every member of your organization and community involved. A dog walk fundraiser seems simple in that it includes walking dogs for a fee. However, there is a lot of planning and organization that goes into making an event or service like this smooth and profitable. Is this a onetime event with a set window of time where people can utilize affordable dog walking services over a few days or weeks? Is this a continuous fundraiser where customers can access services during certain times of day throughout the year? What, specifically, will you use the funds for? Will you accept general donations from those who don't need a dog walked? What services will you offer, and what will you charge? Now that you've defined your event and its purpose, you need to see if you have enough volunteers to pull it off. Start a sign-up sheet or hand out time and talent forms tailored to this fundraiser to current employees, volunteers, and customers. You'll want to map out a pre-planned walking route to streamline the time it takes to walk each dog and determine whether suitable places to get drinks or take bathroom breaks are available for the dogs. Create a printed map and walking instructions to hand out to each volunteer. This also helps with scheduling clients because you'll know how long each walk should take. You'll need to create a schedule using Time management charts or weekly organizers showing each volunteer and dog for all available time slots. Take into account the time it takes to walk your route and add five to ten minutes between each time slot to allow for volunteer breaks or unforeseen issues. Are you going to solicit for customers within your immediate organization, or will you bring it out to the general community as a whole? Advertisements on your website and social media pages work well, as do newspaper articles and radio announcements. Make the most of your dog walk fundraiser by doing some extra research and setting yourself apart from others. Get creative with your services to make them more attractive. This could include a sliding price scale where a person can pay a bit more for additional services such as a wash, extra long walk, or play session. You can also host a few "puppy playdates" where dogs can interact with each other and run around getting their exercise. This can include a sign up booth for your walking services and be hosted at a local dog park with treats for the dogs and an inexpensive lunch for the owners. Avoid using your own leashes and collars when walking other people's animals. For liability's sake it is best to keep to what they provide, should something happen during your walk. If walking two different dogs at once, make sure to know what their behavior history is. You also may want to do some basic breed research to make sure there will be no issues. Finally, always have a release form on file with each and every client. You do not want to be responsible for any unforeseen circumstance or issue that may run your fundraiser into the ground. 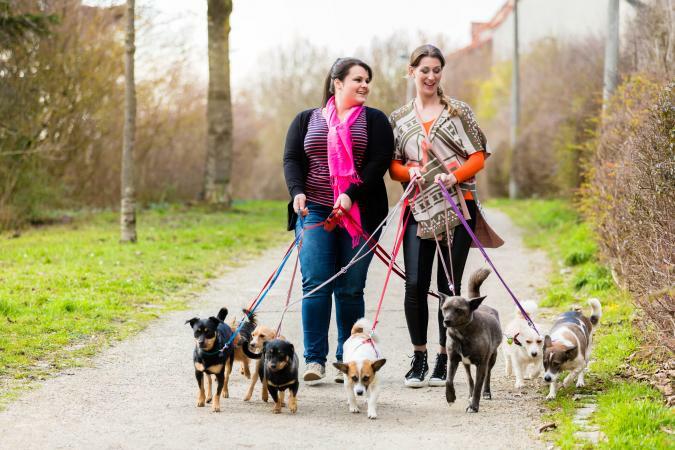 Hosting a dog walk fundraiser makes logical sense for organizations and groups dedicated to providing services to animals, especially canines. Make your fundraiser a success by breaking the process down into small, manageable steps.